Wow! A new Aavikko full length! This just might be the year of the Aavikko. When we first slapped this aluminum disc on our system we must admit we were a little taken aback: Hi-Fi Aavikko? Could it be? For so long these Casio-crazy Finns have championed the most primitive of production aesthetics with a sound only once removed from a ring tone. But here they were in crystal clarity and using the entire spectrum of the audible sound range. Did they get a sponsorship with some big keyboard company? Sources close to Aavikko are keeping tight-lipped about the group’s new cache of keyboard equipment. Okay, let’s put this in perspective before we go any further: a “hi-fi” Aavikko is still “lo-fi” by most standards, so don’t expect any enormous shifts in the Aavikko sound. Bigger than their production changes is perhaps their new-found love of exotica and classic space-age bachelor pad music as a launching pad for their new compositions. 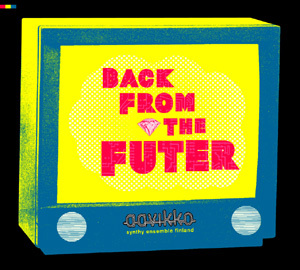 Andee pointed out that a lot of the tunes on Back From The Futur sound like a lo-fi Tipsy. Their retro-futurist vision also smacks mightily of Kraftwerk (vocoder makes its way into a couple songs as well), Gershon Kingsley with bubbling and arpeggiating synth lines, catchy melodies and upbeat tempos, and maybe even the soundtracks for Roger Corman sci-fi flicks. We love it! ***Featuring TOMI LEPPÄNEN (Circle, Pharaoh Overlord, Motorspandex, Rättö ja Lehtisalo) !!!! !